Hermit Hill Books has been in business since February 1997. We quickly outgrew or first space in Middletown Springs, Vermont, and opened in our current location, an 1870s storefront in Poultney, Vermont, on September 1, 2001. We have two spacious rooms with many nooks and crannies that encourage quiet browsing for the book collector or the casual reader. 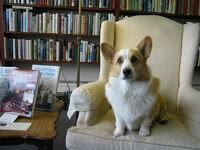 Our staff includes Tucker, the literary corgi; Harriet, the official greeter; and Patty McWilliams, owner and proprietor. 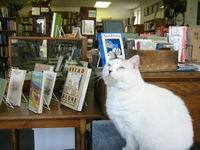 Hermit Hill Books is a member of the Vermont Antiquarian Booksellers Association (VABA). Although our stock of over 30,000 books is general, we do have a wide selection in history, poetry, science, nature literature, modern first editions, and Vermontiana. We also offer an exhaustive search service and can order any book currently in print. We are always looking to increase our stock and are happy to purchase a small bag of books or an entire library. On this website we currently are featuring new arrivals and special offers. We eventually hope to list most of our books so that you can browse our stock from the comfort of your home. If you find anything of interest or need more information, please contact us by e-mail (hermithill@vermontel.net) or by calling us at 802-287-5757. We also hope that you will visit our shop. Poultney, Vermont, is located on the western edge of the state, tucked up against the New York border. It is in the heart of the slate country, which has a strong Welsh heritage. Green Mountain College, the centerpiece of Poultney, is a small liberal arts college with a focus on environmental studies. Directions to Poultney and the shop: Poultney is on Route 30, approximately 7 miles south of Route 4. Turn west at the traffic light. Hermit Hill Books is about half way down Main Street on the right (south) side, across from the Methodist Church.